There are many different varieties of persimmons but only two are commercially available. Persimmons are generally a light yellow-orange to a dark red orange in colour. Depending on the variety, they can be spherical, acorn or pumpkin-shaped. 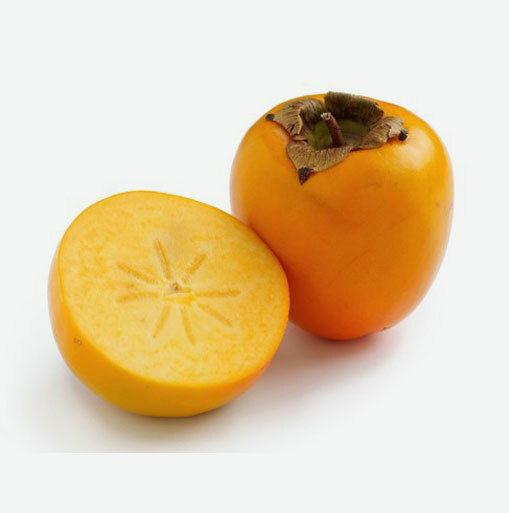 The Hachiya persimmon makes up for approximately 90% of the available variety of fruit, and is acorn-like in shape. It has a tart flavour until it becomes soft-ripe. The Fuyu persimmon is similar in colour to the Hachiya but looks like a squashed tomato. It is smaller, sweeter, and can still be eaten while it is firm. Persimmons deliver a good dose of vitamin A and vitamin C. This fruit is rich in fiber, which helps to maintain regularity. Select persimmons with deep red undertones. Look for persimmons that are round, plump, and have glossy and smooth skin. Avoid ones with blemishes, bruises or cracked skin and missing the green leaves at the top. Store them in the refrigerator when ripe. Ripe Fuyu persimmons will be crisp, while the Hachiyas will be very soft and juicy. Unripe Hachiya persimmons taste very bitter but the tartness will go away as the fruit ripens. The skin of the Hachiya is very bitter and is unpleasant to eat. Wash Fuyu persimmons, remove core and leaves, and slice or eat whole or cube and add to salads. Puree Hachiya persimmon flesh and add it to drinks, smoothies, or fresh fruit sauces. Have a persimmon sherbet! Simply cut off a piece of the pointed tip of the fruit, tightly wrap the fruit, and freeze for up to three months. Defrost the fruit in the refrigerator for about four hours, scoop the fruit, and enjoy!